Being responsible for providing their food straight from nature, the San tribes, also called Bushmen, have quickly found ways to evolve their hunting methods. It is assumed that it did not take long between the adoption of bowhunting and the application of poison arrow heads. An American team of researchers, led by Dr. Caroline S. Chaboo, University of Kansas, have studied the various substances and their sources used in different San groupings from Namibia and have their paper published in the open-access journal ZooKeys. A cross-disciplinary examination involving socio-cultural, historical and ecological as well as entomological knowledge and fieldwork has allowed for a report on the poison sources, their preparation, use and antidotes for the two largest San groupings in Namibia and also summarise the scattered information about other seven groups. While some of the used poisons are derived from certain plants, others have been found to come from specific beetle species. In the present paper, the scientists describe the process of poison preparation, based on their observation among the San peoples. Interestingly, they used neither adults, nor pupae for its production, but only larvae. An observant hunter first dug up a cocoon from under the soil of the host plant, which he broke open and took out the larva from within. 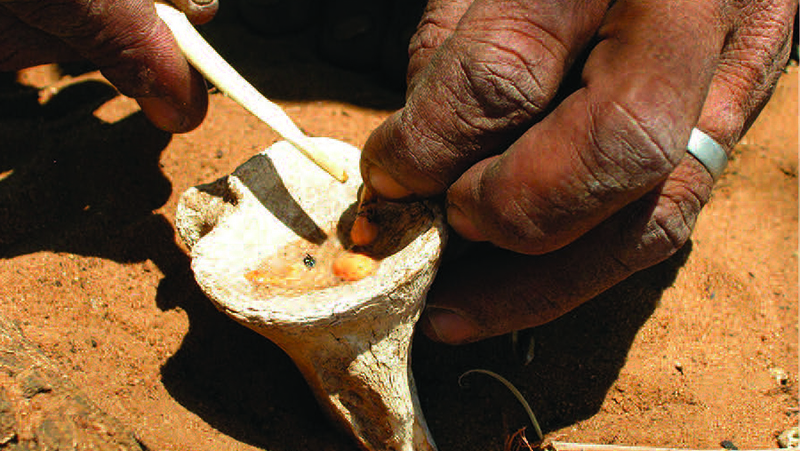 He rolled the larvae between his fingers, rubbing its skin against a stick he used as a pestle, and then extracted its tissue in one of his special tools – an old giraffe or kudu knuckle bone, where he could mix it with the rest of the ingredients. These included a chewed bark of a particular pea flowering plant species and the beans from others. Although nowadays many San tribes that have used bowhunting and poison arrows in the past have abandoned them due to restrictions, modern tools and change of lifestyle in general, the familiarisation, adoption and development of poison weapons dating back to Ancient times are excellent examples of the cognitive shifts in human evolution. “Ethnological data collection such as ours, including the collection of terms in the local vernacular, can open new avenues of research about variations in ecology, fauna and flora,” they conclude.